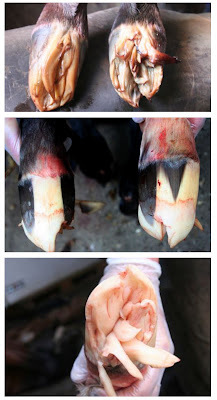 It's foaling season all over the Northern Hemisphere: these post-mortem photos are a reminder of the amazing process that creates the hoof from very soft tissue. Photos provided by Uwe Lukas. It is a pleasure to announce the publication of a new book on farriery. Gesunde Hufe--kein Zufal! by Uwe Lukas was published recently by FN Verlag in Germany and my copy finally floated over to these shores. The title translates to: "Hoof Recovery: No Accident" (sort of), meaning that hoof rehabilitation, the author's specialty, requires skill, experience, and a plan. I am sure someone will leave a comment with a better translation. Uwe is the chairman of the Erster Hufbeschlagsschmiede Verband (EDHV), a.k.a. the German farriers association. His client list reads like a "who's who" of international dressage and show jumping, but his heart seems to be back at the vet clinic; he is the farrier at Tierärztliche Klinik Telgte (Telgte Equine Hospital and surgical center) and is based in Warendorf, the site of the state stud of the Westphalian breed. He also "rehabs" horses by offering long-term residential care at his forge, especially for laminitis cases. While most Americans will be scared away by the German text, the photos in the book are compelling. The foal correction and sport horse shoeing images are among the most instructive without translation, but it is fascinating to see that the bulk of the book is therapeutic cases that are treated with the most high-tech support materials (Vettec and Luwex hoof support materials earn a big thumbs-up from Uwe) but also the most basic German-type Werkman and Kerckhaert shoes and big e-head nails. As in the Hoof Problems book by Rob Van Nassau from Holland, this book has many detailed cases of canker, various types of "loose wall" conditions, coronitis and nasty quarter cracks. It's hard to say if those problems are more prevalent in Europe or if both authors had access to unusually severe cases. I know this blog is read around the world, and some readers can surely read German (or live there), so please consider purchasing this book. I have a shelf of German farrier and hufpflege (hoof nurse) books, but this one seems by far the most contemporary, and breaks some of the stereotypes about traditional German farriery. Surely we are evolving to an international playing field where it will become harder and harder to discern the nationality of the farrier by looking at the shoe, just as the warmblood horses themselves are now so hard to identify by nationality. Aluminum shoes may be the last frontier between American and European farriers. The only aluminum shoe in Uwe's book is a lovely ultra-toe specimen attributed to Dr. Jean-Marie Denoix of France. A unique part of the book explains how to clean feet; the text goes on for quite a while about tidiness in the stable. As Uwe cleans a foot, there's an explanation of how to use bucket underneath to catch the water and keep the floor clean. All the settings for the photos are very tidy. 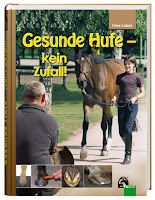 Uwe's book is published by FN Verlag, the national equestrian association in Germany, and may be purchased through their web site's bookshop. Thanks to Uwe and the EHDV for all the help they give to Hoofcare and Lameness Journal.